The Yamatake AT9000 Advanced Transmitter is a microprocessor-based smart transmitter that features high performance and excellent stability. 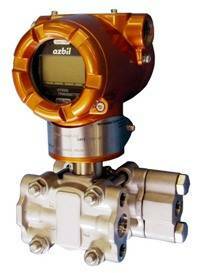 Capable of measuring gas, liquid, vapour, and liquid levels, it transmits 4 to 20 mA DC analogue and digital signals according to the measured differential pressure. It can also execute two-way communications between the CommPad (Handy Communicator) or Hart® 375 communicator, thus facilitating self-diagnosis, rang resetting, and automatic zero adjustment. A wide range of models is available to meet user requirements. They include draft range differential pressure, standard differential pressure, high differential pressure, standard differential pressure/high static pressure, and high differential pressure/high static pressure models and a wide variety of corrosion-resistant materials for wetted parts are also available. A wide measuring range is available from a single model. This feature is highly effective in taking measurement over a wide range and reducing the need for inventory. For example the Model GTX30D/31D/32D offers a range ability: 0.5 to 100 kPa (range ability: 200 to 1). In addition it offers high performance and stability with unique characterization and composite semiconductor sensors realize high accuracy up to 0.04%F.S, Fast response within 100 msec and the proven Yamatake proven sensor technology enables Long-term stability up to 0.1% of URL per 10-year.